Luxuriate at the richness that only the premium collection of Randolph kitchen cabinets lend with their exquisite dark façade that makes up for a fabulous addition to your décor. Craftsmen Network allows homeowners to enjoy more than just a boost in aesthetics as we offer RTA cabinets that are not only beautiful but also brandishes durability and functionality as well. Walnut has long since been among the well-loved materials when it comes to furniture, flooring and other home improvements, furnishings as well woodworking products. And what better way to integrate the delightful offering of appeal and practicality than buying your very own set of Randolph kitchen cabinets. 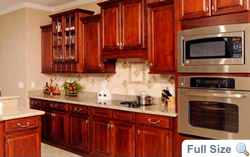 Craftsmen Network offers the finest line of Randolph kitchen cabinets made from the choicest of Walnut, cutting edge manufacturing techniques, and innovative designs and additional features. All these allow the inherent charm of Randolph RTA cabinets to grace the heart of your homes in the longest possible time, through years of heavy labor and constant changes in environment and temperatures. The distinctive allure that Randolph kitchen cabinets emanate with comes from the inherently dark tones of Walnut timber that comes alive with the generous sprinkling of course grains that creates a rich feel to the cabinetry. This natural attractiveness is made all the more striking by the luscious Cherry finish that creates depth and intimacy into the overall design of your kitchen. 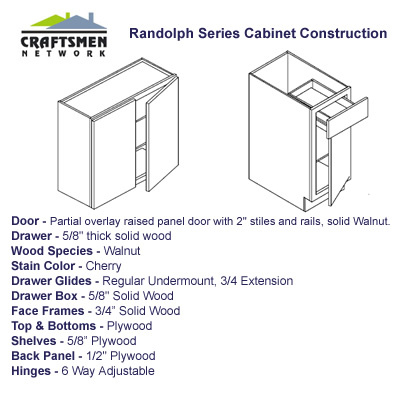 Aside from this advantage in price, get your very own set of Randolph cabinets without all the hassles. Highly dedicated to customer satisfaction, Craftsmen Network makes shopping most convenient on your end.